Eyes Meadow is located close to the village centre and is a 48 acre sports and recreational site. 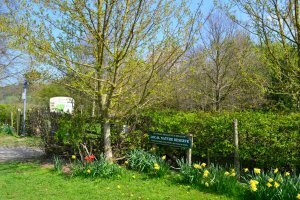 Located on the site are six football pitches, two cricket pitches and an award winning nature reserve. Plans for a bowling green and other facilities are currently being pursued. The site is home amongst others to Duffield Dynamos Football Club and Duffield Cricket Club which has been located on the site for more than 100 years. The River Derwent runs alongside the site and is also popular with anglers being home to the Derby Angling Federation. Duffield Dynamos FC has recently installed a defibrillator on site which can be found at the cricket pavilion. Eyes Meadow is located within the World Heritage Site and boasts stunning views of the Derwent Valley. In addition to sport, Eyes Meadow is also used as the location for the village carnival and annual bonfire and firework event. It is popular with walkers and joggers and has on occasion been used for weddings and other social activities. If you would like to find out more about this please contact the Clerk. Unfortunately we are unable to accommodate low loader vehicles onto the site, but if you are considering holding your event here, or are looking for a new football venue, take a look at our hire conditions and booking rates in the document below. Being of a tranquil nature, a number of regular users have chosen the site as a location to place commemorative seats. The document below gives details of charges to hire the Meadow for sporting or other events; to make an enquiry contact the Parish Clerk. Millennium Meadow nature reserve - April 2015. The Millennium Meadow lies alongside Eyes Meadow. The Millennium Meadow was created in 1999, when the Duffield Community Association felt that the village would want a project to mark the Millennium and canvassed local people for their opinions. By far the most popular suggestion was the planting of trees and the re-introduction of wild flowers. 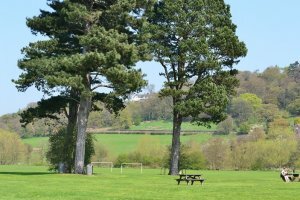 The Duffield Millennium Meadow is a classified Local Nature Reserve and is managed by a Conservation Trust which is a registered charity. The meadow measures 5.7 hectares and is bounded on three sides by the Derwent and Ecclesbourne Rivers.